September is here and right around the bend is autumn. September is a month after my own heart, with my birthday and my siblings’ birthdays. We always had a huge party for the three of us, usually on Labor Day weekend. Summer was waning, but their was still a feel of excitement in the air for the oncoming colors of fall. As for the insects, I have noticed over the years that insects, especially bees and butterflies are putting in a final push for collection of nectar and pollen for their overwintering broods. Below are the 5 best plants for pollinators in autumn (for landscape use). Asters often are planted with mums or used in fall displays along with gourds or pumpkins. There are many different sizes and cultivars of asters, some for every landscape from native areas to cottage gardens. They range in heights from 12 inches to 4 feet. Colors can be purple, white, red, pink, yellow, or blue. There are asters for full sun to almost full shade. Some are drought tolerant and some prefer moist areas. Bloom time is from September to first frost. And the bees love them! Perennial sunflowers can dominate the landscape, with both their size and their flower power. They produce a ton of flowers per plant and really attract in the bees and pollinators. Some cultivars exist of native sunflowers and can be nice additions to the garden. Mix tall sunflowers willowleaf and sawtooth with native grasses for a grand display. Many native sunflowers grow in mildly wet areas along streambanks and in ditches, while others prefer dry, sandy soils. Bloom time ranges from August to first frost. 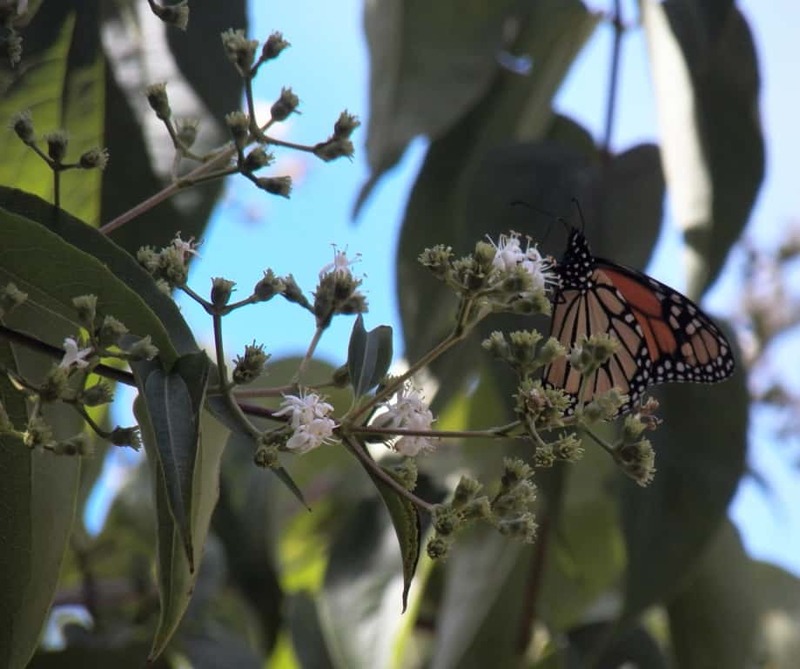 While the Seven-Son Tree is not a perennial plant but a true tree or large shrub, it is one of the best introduced plants for pollinators. Starting around the end of August or the beginning of July it produces loads of pure-white blossoms which attract pollinators for miles. This small tree has the full package with flowers in late summer and interesting bark in the winter. It fits into nearly every landscape. Plant it in full sun to part shade and enjoy the view. Flowers are followed by red calyxes which add to the autumn interest. Tall sedum is often referred to as Live-forever in my area. This is a name which I had not grown up with, but was introduced to when I moved to northeast Kansas. It certainly is a tough plant. It loves full sun and drought conditions, as any good succulent. Tall sedum can be pulled from the ground and left on a gravel driveway for 3 months (or more) without regular watering before being planted back in the ground. It grows 2 to 3 feet tall and wide, and blooms pink to white from September to first frost. A pollinator magnet for sure! Goldenrods are often unjustly blamed for allergies in late summer to fall, when it is really the ragweeds which cause all the disturbance. Goldenrods light up the roadsides and pastures with their pure yellow and gold flowers, attracting a large variety of pollinators, from bees to wasps, and beetles to butterflies. Sizes range from 1 foot to 10 feet (giant). Goldenrods, like their cousins the asters, can grow in a variety of habitats, from shaded woodlands to open prairies. From wet bogs to dry sand. They bloom from August to first frost. Add them in masses or single plantings for the greatest of fall shows.